When it comes to keeping your home cool in the summer and warm in the winter, heating, ventilation and air conditioning (HVAC) systems are great at doing just that. However, they can be costly to operate, especially if they aren’t maintained regularly. From “Power to Save” a publication of Hawaiian Electric Company. Note that HVAC is the top energy consumer for the average family of four. So to help you save money and get a better understanding of how these systems work we’ve come up with the following guide to the basics of HVAC. However, this system wouldn’t be very effective if it wasn’t paired with a home ventilation system. After all, a big part of keeping your home comfortable is ensuring that it gets a steady supply of fresh air, so let’s take a look at how home ventilation systems work. 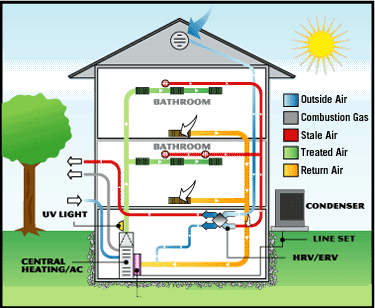 As you can see, fresh air enters your home and is passed through either your home’s furnace or A/C unit and is heated or cooled to the desired temperature and then distributed throughout the home. After the air has been delivered to your living spaces, the ventilation ducts located in your kitchen and bathrooms pull the air up to an exhaust vent and out of the home. Thus providing your home with a constant supply of fresh air, while disposing of old stagnant air. Now, I know what you’re thinking–you’re sending conditioned (either heated or cooled air) out of the home and bringing in outside air that then needs to be heated or cooled again…isn’t that a huge efficiency loss? Yes, it is. So…heat exchangers to the rescue. These devices allow for the temperature of departing air to transfer either its warmth or its coolth (why isn’t there a word for that?) to the new air, without mixing with it directly. Thus, fresh air, and less loss of the heating or cooling (or heat or coolth, if you will). Now that you have a better idea of how the air conditioning system works in your home, try implementing some of these easy maintenance tips for your A/C unit. They should help to reduce the amount of energy your system uses, and thus, save you money on your monthly electric bill! If you’re looking for ways to save money and make these systems more energy efficient, take a look at some of our green home improvement projects: Green Living Ideas, after all, is a top 20 home improvement website! 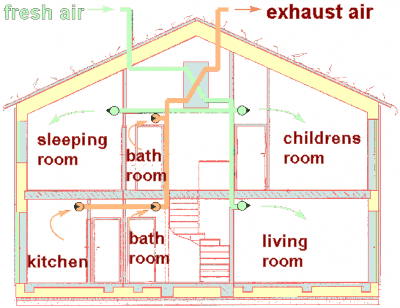 Tags: air conditioning, energy usage, energy-efficiency, Heating, how does it work, HVAC, reduce, ventilation, what is it?